Rummage sale! Love them! The paint really made the candlestick better. 2 of my favorite things, a good sale and paint!!! Love it, now I know what to do with my old wrought iron candle honder!! Thanks for sharing!! Thanks, Melanie! Good luck with your wrought Iron, I'm sure it will be fantastic! Great job. I don't know why that dark wrought iron was ever the rage. It's so colonial! Your lightened version is much better! Found you at Ginger Snap Crafts. 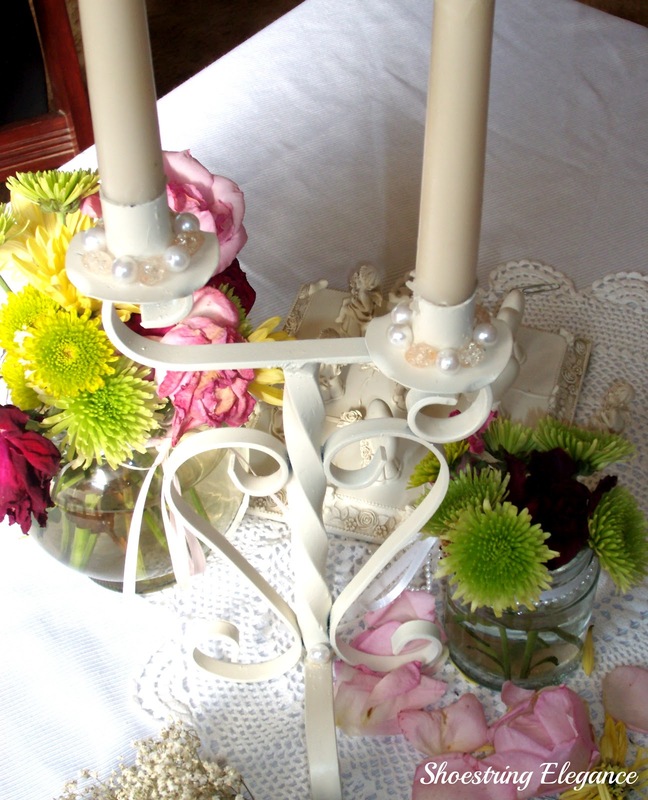 This is pretty--I've got a black candle holder just sitting around, and so you've given me some inspiration for revamping it--thank you! Thanks, Athena!! I'm so glad you liked it. Let me know how yours turns out! Thanks you, Donna!! So glad to hear it's not just me! This looks gorgeous! Love the repaint and the sweet pearly beads.. good thing that bracelet broke! Thanks AmieAnn!! Hopping over to your blog! It looks great! Thanks for sharing at the All Star Block Party! Thank you, Courtney, so much!! 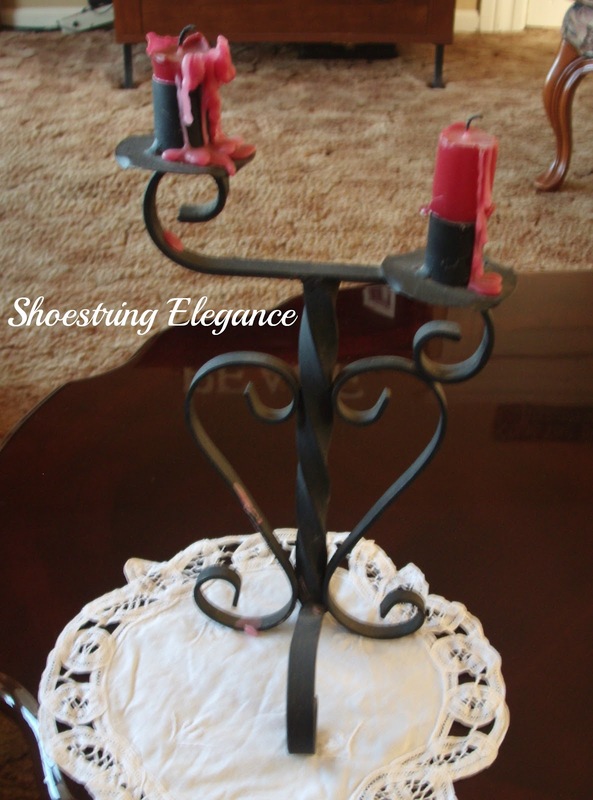 As you know it all started with my little redo of your double ruffles tablecloth! I never forget that. And you are still inspiring me!! Congratulations to you for all your success!! I'm so honored and humbled to be able to link up with you on your Beautiful"Feathered Nest Friday's"!! Hugs and Many Blessing to you and your Loved ones! Thanks Pammy and Jennifer!! Your comments and support mean more to me than I think you will ever know!! Thank you so much for your lovely comment, Tani! So lovely! I think I am starting to look at candle holders in a different light :) Thank you for linking this up to Rustic Restorations Weekend! I love it! it sure looks so pretty now! are such a pleasure to get and read..Thanks for that, means alot!! Great post. I found this through the Create and Inspire linky party. I linked in a rhubarb and banana jam I did to use up old bananas. Love it! I love what a little paint can do to change the whole look! Thank you for sharing it with us at The "Sunday Stop"
Love adding the beads! Who a great transformation and now it is so feminine. You are so clever:) Thank you for sharing at Freedom Fridays! Thanks so much for all your Lovely comments!! You are all too kind!!! Most Sincerely and with Many Blessing and Best Wishes!! That transformation is amazing -- the paint went on so smoothly, I can never seem to do that! It looks smooth, Mrs. Cozy, but don't be fooled, it was just as difficult for me as I'm sure it has been for you. Especially with all the stuck on years of old wax. There was chipping and alot of sanding involved..It does look like it has a smooth gloss finish to it but still really does feel like coarse rod iron, but sitting in the center of the table not too many touch it so I was very pleased. Thanks for visiting and your comment!! I hope you'll come back! Great idea - and love the background! Your wrought iron piece has such a pretty shape that I think it's lovely in ANY color! :-) Today's white certainly gives it a fresh face. Enjoy! I agree, I'm loving the white/cream a whole lot more than I am the black. It's amazing what a little paint and some pearls can do. I would love it if you could link your project up at my "Pin Party"
Thanks so much, Tamara! I'm sorry you gave it all away, too. Look all the projects you could have had..lol.. sorry, not meaning to rub it in. I'm glad you liked it and thanks so much for hosting the party over @ Ectetorize, and commenting here!! It is very much appreciated. 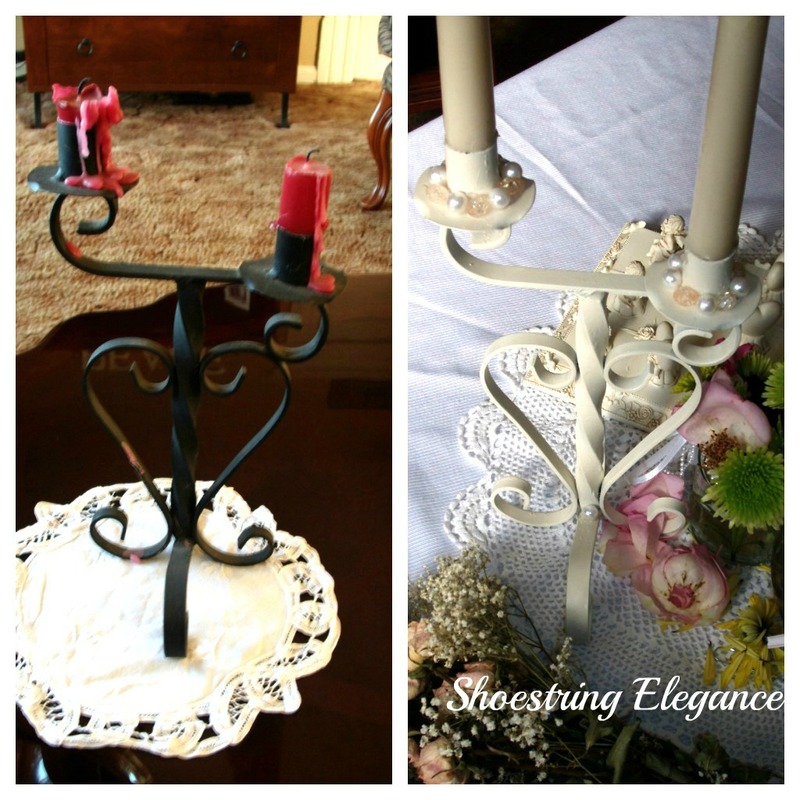 The candlestick went from ugly to cute. It was meant to be white, and love the beads addition- took it to a whole new level! So glad you shared your creative inspiration with Sunday's Best - you helped to make it a fun party. Ps don't see my party button posted above. Hi, Kathy! Again I'm so pleased and grateful for you hosting this link party and for your kind comment. I do have your button on my sidebar, your's did not say include a link or button in "the actual post" . If that is what you'd like please let me know, otherwise I proudly have your button on my right sidebar. My bad, your side bar is just great! Hope you have a great week and hope to see you next Sunday! Thanks for sharing this awesome project on Simple & Sweet Fridays. New Follower! Happy to be able to!! Thanks for having me! Hi, hopped over from the All Star Block party. I linked up a redo also so thought I would visit you. What a difference a bit of paint and bling can make. Now a new follower. Thanks so much, Jenn!!! I', so glad you hopped over my way!! Hi there...wow you really have some great ideas! I'm a longtime thrifter and love a good hunt. I'm visiting via the made in a day blog hop so I hope you can stop by and visit the farm at sharonstanleywrites.blogspot.com. Right now, I think I'll hope over to a thrift store...very inspired! Love thrifting, It's not just a way to shop, It's a sport! I'm always on the hunt, too, for whatever can save me $$$ and make my little place a little more special. p.s. Sharon, I hopped back to you, It seems we share a couple other "Loves" Napping and tubs!! Yay, us! Now I'm your newest follower. Thanks for sharing at Create & Inspire Party. Thank you all for your kind words and support!! It is very much appreciated!! I never cease to be amazed how a simple coat of paint can update a piece. Thanks for sharing on beColorful this week. A little spray paint and a bit of bling -- good anytime! thanks so much for sharing on Busy Monday! I love the way you did it. The color totally transformed it beautifully! Isn't it great how a bit of paint and a few little details can totally transform an object? This is lovely. Thanks for sharing on tout It Tuesday! Hope to see you tomorrow.